Mix the flour, cornmeal, sugar, baking powder, and salt in a large bowl. In a separate bowl, combine the milk, eggs, and butter. whisk the wet ingredients into the dry until most of the lumps are dissolved. Don’t overmix! add most of the grated Cheddar reserving 1/4 cup, the scallions and jalapenos, and allow the mixture to sit at room temperature for 20 minutes. Meanwhile, preheat the oven to 350 degrees F. Grease a large cast iron skillet with a little butter. Pour the batter into the prepared pan, smooth the top, and sprinkle with the remaining grated Cheddar and extra chopped scallions. Bake for 30 to 35 minutes, or until a toothpick comes out clean. Cool and cut into large squares. Serve warm or at room temperature. Serve drizzled with honey. Bon Appetit! 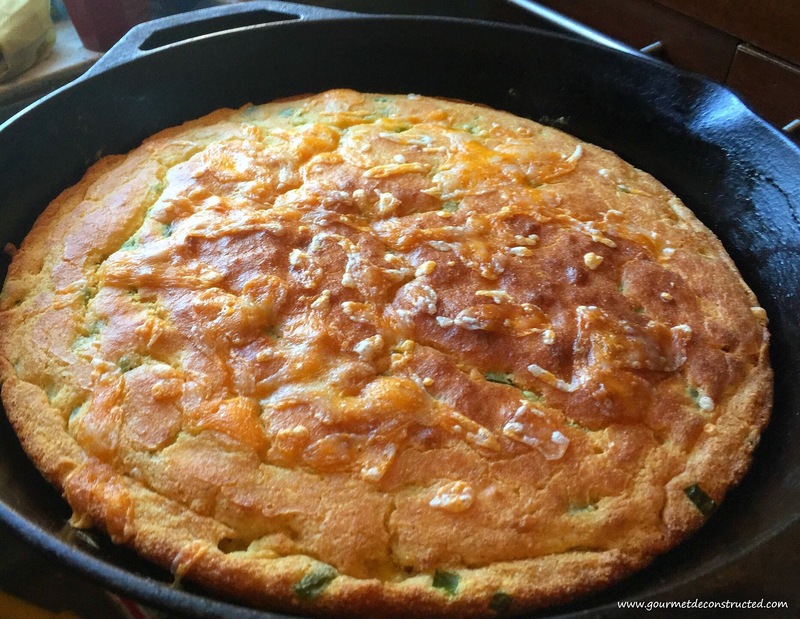 Posted on January 11, 2016, in Meatless Mondays and tagged cheddar cheese, cornbread, jalepeno, scallions, southern cooking. Bookmark the permalink. 2 Comments. This looks lovely Justice. I am just back from a flying trip to NY. We managed to do meetings in NJ, Phili and Long Island over a couple of days. I am back in Ireland, not knowing which way is up. Hope you are well. Thank you Conor I’m doing quite well. I hope all is well with you and the family!